#1 How to Effectively Use Them for Self-Defense? So, you bought a stun gun. Now what? Well, once you purchase a stun gun, it’s important to learn a little bit about how you can effectively use it for self-defense. 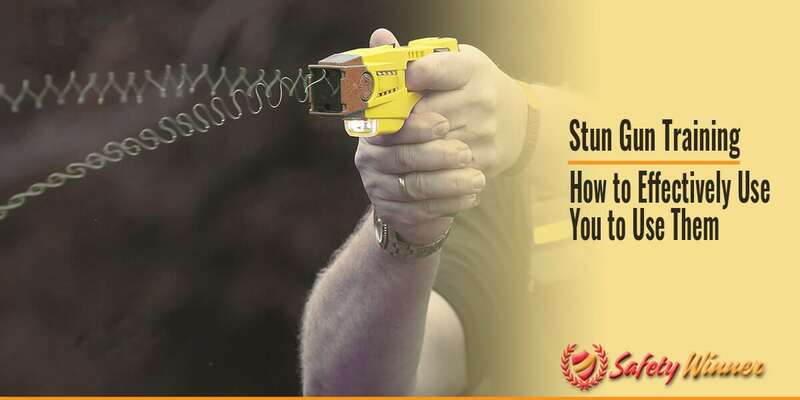 That being said, check out our stun gun training guide below! Most stun guns are powered by a rechargeable battery. While this is extremely convenient for budget, this means you’re going to have to be mindful about charging your stun gun. A good rule of thumb is to plug your stun gun into the charger on a weekly basis. Overall, charging your stun gun is super simple, so there’s no excuse as to why you can’t do it. Plus, you don’t want to be in a situation in which you need your stun gun, but it’s dead. Although this is essentially common sense, it’s important that we verbalize this tip. If you purchase a stun gun, you should always have it handy. This means that your stun gun shouldn’t be thrown into a box in your garage, tossed into a miscellaneous drawer, or jumbled up with all the other items you have in your purse. Instead, your stun gun should always be in an easily accessible location. If you wear belts a lot, you should consider purchasing a mini stun gun that comes with a belt loop. Therefore, you could simply secure your stun gun to your pants and you wouldn’t ever have to worry about quickly accessing your stun gun. Although a stun gun would aggravate any part of the body you aim at, there are certain points of contact where the muscles are a prime target. Since stun guns target muscles, most of the prime points of contact are in areas where there is a maximum amount of muscle density. These points include the neck, pecks, triceps, lower arms, upper abdomen, ribs, upper thighs & inner thighs. One of the worst things you could possibly do is have your stun gun ready to aim, but hesitate when you have a direct point of contact. This is a terrible thing to do for a multitude of reasons. Firstly, hesitating shows your attacker that you have a little bit of fear. When they see this, they might attempt to use even more force to coerce you because they’ll believe you’re scared to stick up for yourself. There’s also the dynamic that hesitation could result in a missed shot. For example, let’s say you had direct aim on a point of contact. If you hesitated, your attacker might shift and your new aim might be on a bonier part of the body, which wouldn’t give the same result as the initial aim at the point of contact would have given. Long story short: aim and shoot. There’s nothing to be scared of. If I had a dollar for every time I heard someone spread a myth about a stun gun, I would be filthy rich. One of the biggest myths people get scared of is the idea that a stun gun will shock you while you fire it at someone. This is by far one of the biggest lies. Your stun gun will not stun you when you press it into someone. The only person that is going to feel the pain of your stun gun is your attacker. So, don’t be afraid. Okay, so your stun gun might not purposely stun you when you’re targeting someone else. But, there’s always the chance that your stun gun could accidentally stun you when you pick it up or knock into it. That’s why modern stun guns have innovative safety switches in which they will protect you from accidentally stunning yourself. All you have to do is turn the safety switch on when you don’t want to use your stun gun, and on when you do want to use your stun gun. Let’s face it: stunning someone can be intimidating, especially for the first time. That’s where practice comes in! Instead of panicking in a moment when you really need to use your stun gun, simply practice using your stun gun every once in a while until you feel comfortable. Just keep in mind that while you’re practicing using your stun gun, you should be mindful of the safety of yourself and other people around you. Do not practice using your stun gun on a person or animal. Yes, stun guns do harm people. After all, stun guns are powerful enough that your attacker should be on the ground in pain for a few moments. But, that’s just it. Your attack will only be on the ground for a few moments. That’s because the symptoms of a stun gun are fleeting. In other words, if you were stun gunned, you would most likely feel the stun gun for only a few moments. Then, you might be sore, but you would be fine and stable enough to walk and function. This is because stun guns aren’t made to permanently injure people. Of course, accidents can happen, and stun guns can create injuries. But, that only happens when people do not follow instructions properly. So, as long as you utilize a stun gun properly, without intent to severely injure a person, you should be fine. Like previously stated, stun guns usually don’t severely injure a person. Instead, they’re meant to act as a debilitating force that will hinder a person’s plan of attack. After stun gunning your target, you should have enough time to run away and seek help. Regardless of whether or not you effectively stun gun your target, you should have a plan B in mind. Safety plans can range from something as simple as utilizing other resources as self-defense weapons, such as keys, or simply running away and escaping.